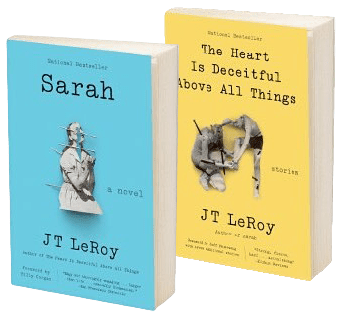 As our regular readers no doubt noticed, we had to change plans for the Toronto opening of Author: The JT LeRoy Story on November 2 and 3. We originally announced personal appearances at the theater for audience Q&As, but had to change to Skype sessions at the last minute. And now we also have to announce with regret the cancellation of laura’s appearance at Book Court in Brooklyn, which had been scheduled for November 6. We’re sorry friends, but you just can’t Skype to a book signing… We further regret to announce that Laura’s appearance at the Stockholm Film Festival has also been cancelled – but she will be Skyping to them too, so watch this space or the website’s Author page for the precise date and time. The explanation is simple: The day before her flight to Canada, Laura had a small accident and fractured a bone in her left foot. We’re saving the cool X-ray photo for this month’s newsletter, but here’s Laura pictured below, showing up the next day for a radio interview, boot and all. Watch the website for news of when her Brooklyn appearance will be rescheduled. In the meantime, we offer here as consolation Laura’s awesome new interview on Q with Tom Powers from CBC Radio.